Hydrangeas are such a delightful plant to have in the garden. They are a deciduous shrub, which comes to life in the springtime and then bears beautiful flower heads through the summer and autumn. The hydrangea bush can last for decades in the garden. Like roses, they are a plant that just keeps on giving. They can grow up to 2 metres high with a similar width in the right conditions. The flowers heads vary within the species from giant globular heads to lacy delicate blooms. The colours can vary from deep red, pink, white mauve and blue. 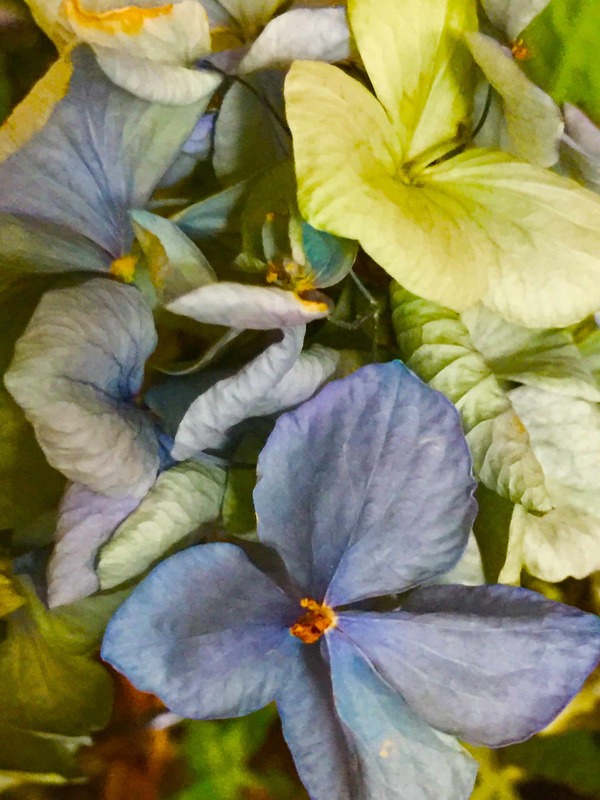 Personally I adore the giant blue flower heads, also known as French Hydrangeas,(ironic, because I believe they originated in Japan). The colour of the flowers will vary according to the soil type you have. That is if the soil is very alkaline they will be pink and if the soil is acid, they will be blue. They are a good garden indicator of your soil type. 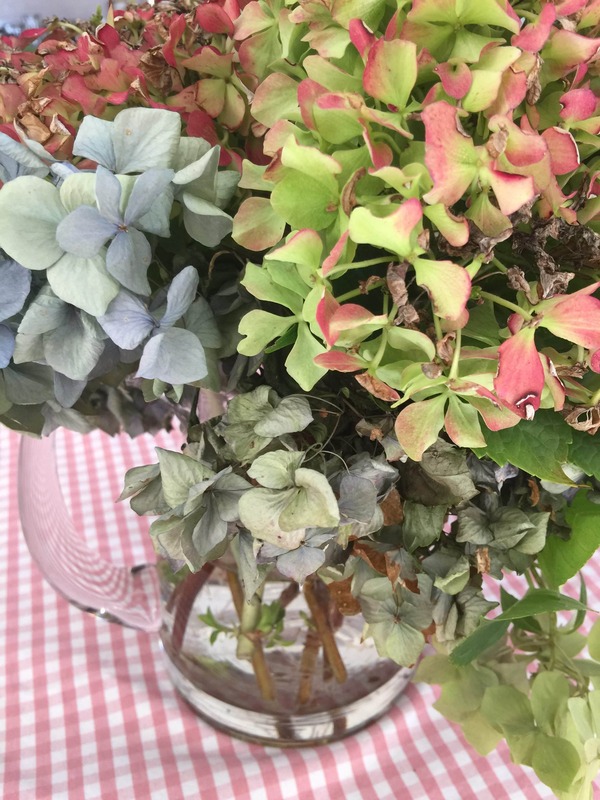 The marvellous thing with hydrangeas, is the flowers last a long time on the bush and eventually will fade greener and dry on the bush. 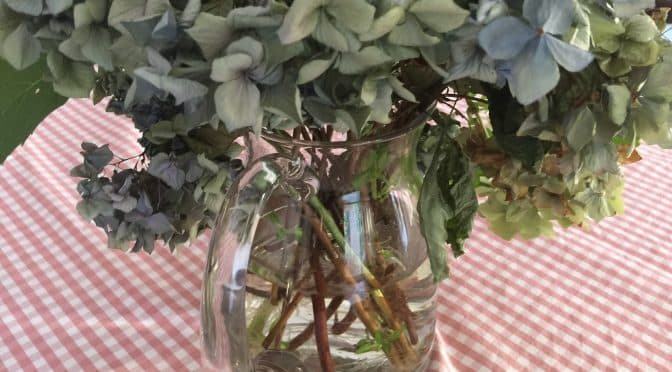 They can have a second life as dried flower, indoors, and make a stunning indoor display. If the blooms are picked at the end of summer they will last many weeks. When they have dried, they can last for years. The muted colours of the hydrangeas as they fade from summer make a beautiful indoor display. 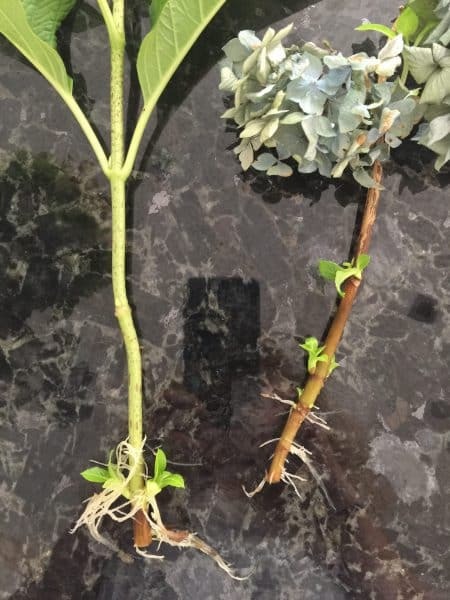 The good news is, you can easily propagate and multiply your hydrangeas at home with minimal effort. At the end of summer, take some cuttings, with and without blooms. Make sure you have a reasonable stem length, at least 10″. 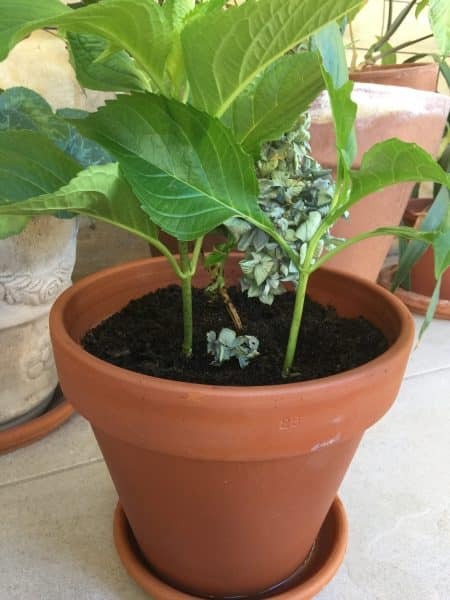 Remove a couple of the lower leaves. 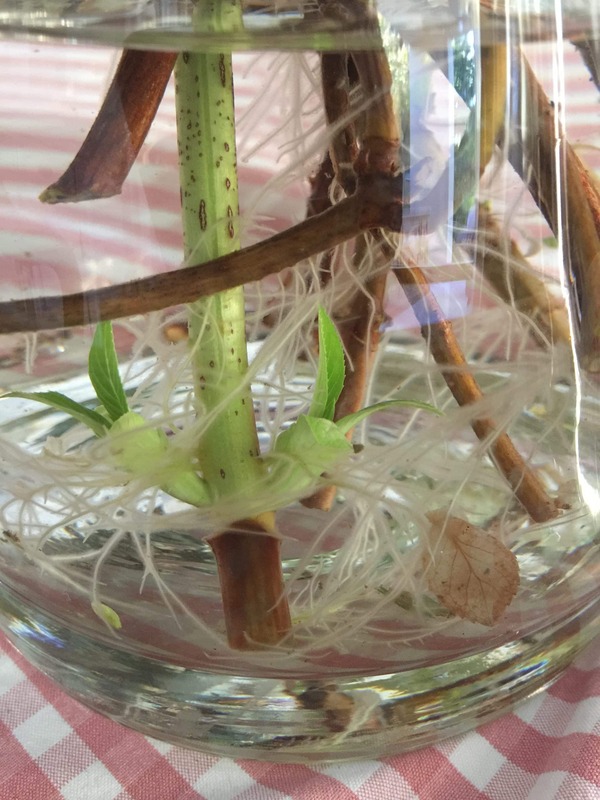 Arrange your cuttings and blooms in a nice clear vase or jug. Enjoy the display. Make sure to top up and change the water regularly. After 4 – 6 weeks they would grow some roots. Carefully remove from the jug. This is how the cuttings will look. Plant out into pots or the garden. Keep moist. 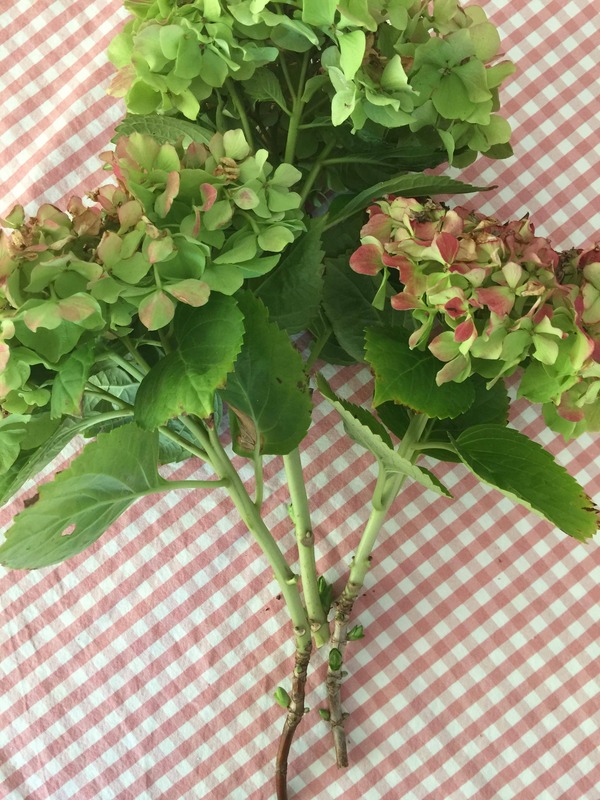 Hydrangeas make a beautiful gift. 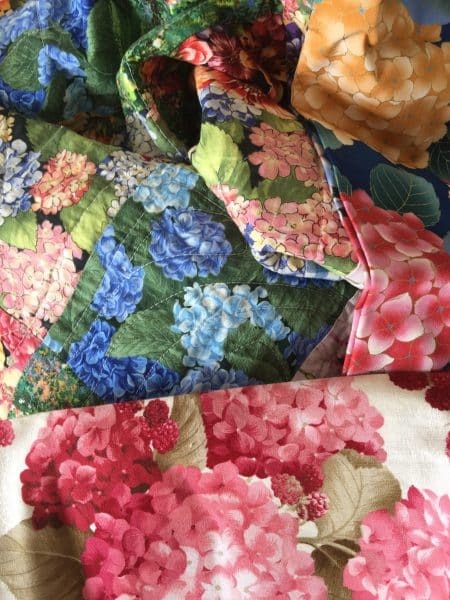 I love hydrangeas depicted in fabrics too. They make a spectacularly beautiful addition to a quilt.